There is so much on in London at present. I'm not going to get around to everything to show you. However I'll do my best to give you wee snippets. 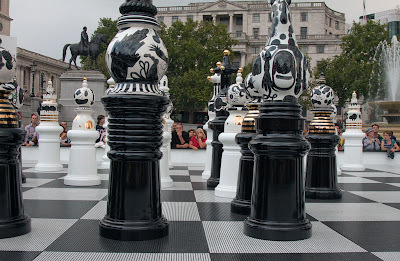 As part of the Design Festival a giant mosaic glass chess board with huge ceramic chess pieces sits in the centre of Trafalgar Square. Created by Spanish designer Jamie Haydón. He was inspired by the battle of Trafalgar and each of the 2m pieces represents an element of London. Players sit above the board as if on thrones, while commentators direct handlers to move the pieces (on castor's) around the board. My chess playing skills aren't up to this kind of public humiliation. The installation is around until 23 September. Definitely worth a visit. Don't forget today is the final day to enter my trip to Brussels competition. Tripped over your blog so I have started following. Great city for photos. Those chess pieces look absolutely beautiful! What a lovely and entertaining concept. must be fun out there! Not sure what's what - is that an especially cheerful pawn? I can't play chess (I mean, I know the moves - but that's not enough . . . and my will to win is zilch) and I usually find watching a game of chess fascinating only as a way to marvel that no-body else seems to think it's boring. But I would very much like to see these pieces being moved. There's a water clock in the Science Museum (the London one) and all it does is drip . . . but I found it so fascinating I spent ages standing in front of it watching the drips drop. This chess board and it's giant chess pieces seem to hold a similar atmosphere - simultaneously moving and static. Sculpture that has a purpose, nice. Mo - I'm being a bit thick with the links . . . how long is the this (the chess) on for? In all the years I was in London I never did the tourist bit so it is geat to see my favourite city through your eyes. Great and thanks. can't imagine a gigantic chessboard while playing checkmate! it's even made in ceramic! Such a neat idea. Soon to be a spectator sport. I wish I could see this. I think I would like it. It makes me think of a of an old TV show called "The Prisoner". There was a life-sized chess set featured in that show. What a great concept. I can't imagine being brave enough to play in front of the whole square and directing other people to move for me (surely they'd have better ideas for moves than I would!). The giant chess board and pieces it just great. Even if you don't play chess, the entire installation and event around it look like so much fun...and make for an awesome photo. Love those giant chess sets though I don't know how to play chess. Great image. London is so wonderful to photograph. I can't make out the details and probably wouldn't understand even if I did, but they sure look wonderful! That is really cool! Great design! this looks like fun. sort of alice in wonderland like.